All articles of the Journal of Ceramic Science and Technology are published under the terms of the Attribution 4.0 International (CC BY 4.0) which allows users to copy, distribute and transmit an article, adapt the article and make commercial use of the article. The CC BY license permits commercial and non-commercial re-use of an open access article, as long as the author is properly attributed. Copyright on any article published in the Journal of Ceramic Science and Technology is retained by the author(s). Authors grant Göller Verlag GmbH a license to publish the article and identify itself as the original publisher. Authors also grant any third party the right to use the article freely as long as its original authors, citation details and publisher are identified. Use of the article in whole or part in any medium requires attribution suitable in form and content as follows: [Title of Article/Author/Journal Title and Volume/Issue. Copyright (c) [year] [copyright owner as specified in the Journal]. 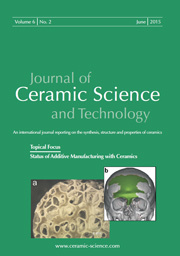 Links to the final article on Journal of Ceramic Science and Technology’s website are encouraged where applicable. The Creative Commons Attribution License does not affect the moral rights of authors, including without limitation the right not to have their work subjected to derogatory treatment. It also does not affect any other rights held by authors or third parties in the article, including trademark or patent rights, or the rights of privacy and publicity. Use of the article must not assert or imply, whether implicitly or explicitly, any connection with, endorsement or sponsorship of such use by the author, publisher or any other party associated with the article.